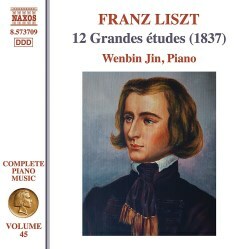 The ongoing Naxos series of Liszt piano works finally reaches the infamous 12 Grandes Etudes – the 1837 version of the ‘Douze Études d'exécution transcendante’ (S139, from 1851). The later version of these works is hard enough but this, the middle version, is even more difficult so it has only been recorded a handful (excuse the pun) of times previously – by Idil Biret, Leslie Howard (review), Massimo Gon and Janice Weber. It’s also fair to say that I have been waiting for this one – I always like to have more than one performance of a work in my collection and, for this work, the only recording from the list I gave that I am missing in my collection is that by Massimo Gon one (but I have heard that via a streaming service). Anyway, the set begins with a short Presto in C major, mostly made up of arpeggios and is the easiest of the set. It underwent little revision to become ‘Preludio’ in the final version. This short warm up work is dispatched with considerable aplomb. The second etude in A minor is a supercharged version of the later version including extra leaps, thirds and assorted other difficulties. All of these are coped with admirably and the speed is breath-takingly fast, as indicated by the tempo direction of Molto vivace. Comparing this to the other available recordings I have, this is the fastest but only by a couple of seconds and the clarity in the left hand is amazing. The F major third study is mostly the same as the later version (Paysage – Landscape) but includes a faster presto section in the middle and some more difficulties besides. The mood created by the slower section is really rather lovely and shows that Mr. Jin can play wonderfully evocatively as well as blazing away with the best of them in the virtuoso sections of these works. The fourth study, in D minor is an earlier version of what eventually evolved into ‘Mazeppa’. Again the tempo is fast but this does not mean that it is purely finger spinning with no emotion, the central section in B flat is beautifully played and, following along with the score, I still find it incredible that he is able to play this amazingly difficult music so well. The work unfolds almost like a set of variations with each one subtly different. The fifth of the etudes is somewhat different to its later incarnation – the later version is a finger twisting exercise but this is on a whole different level with even more added difficulties. It is maybe not possible to hear the differences at first listening but with the score in hand; they can be discerned with some careful listening. Largo patetico is the tempo direction on the next study but the whole of the study is not covered by this as there are ‘accelerandos’ at various intervals as the piece develops. This starts off gloomily in G minor and some incredibly large stretches in the base clef which Liszt asks the performer to take with the left hand only, even though it could probably be redistributed more fairly between the hands. The alternation of the tune between the hands - when the key changes to D major is amazingly well done and flows really well. I am amazed by how quietly he is able to play such complicated music! At the sempre ff with tremelandos in the left hand, the sound generated is incredible. I should also say that 9 times out of 10, Mr. Jin does not follow Liszt’s ‘ossia’ passages (which in most cases offer easier solutions), he mostly follows the main text throughout and leading to another amazing performance. The seventh of these pieces ultimately metamorphosed in ‘Eroica’ but this middle version is structured slightly differently and it has been written that maybe this is a better piece than the later work. Personally, I like both versions. There is a fair amount of humour in the playing here with the rather comical bouncing along with some nice accompaniment. The touch on the piano keys is also very light, a way of playing which suits this piece well and serves as a good way of building up to the staccato sempre section from about 3 and a half minutes. I really like the way Liszt turns the tune on its head in an absurdly difficult part about 4 minutes in. All technical difficulties are forgotten in an amazing performance of this brilliant work. The eighth study presents the pianist with multiple repeated notes at the beginning but Mr. Jin’s delicate way of playing makes them sound as if they are not a problem at all. The bouncy tune is very measured as it should be and is indicated in the score. The Capriccio like section which follows on is amazingly well played and leads into an animato section which leads back to the happy bouncing tune. As with the previous etude, the structure of this work is different from the more familiar later version so be prepared for a few surprises if you don’t know it already! This is a real ‘tour de force’ and this incredible pace and playing continues through the whole work. There is a change of mood for the ninth of the studies – a rather lovely Andantino. There are a multitude of differences here from the later version but the overall effect is just as wonderful as in ‘Ricordanza’. There is some incredibly delicate and some lovely playing here. I actually prefer the non-syncopated version of the left hand figuration in this version of the study; it just sounds more natural to my ears. The middle section with the accompanying chords in the bass (marked largamento molto espressivo) is absolutely gorgeously played. None of the numerous difficulties and finger twisting notation is sidestepped here and the whole piece works wonderfully well. The cadenza ending at 6’51’’ is a superb example of delicacy here and works as a good comparison to the power required elsewhere. The closing calmato section is almost reverential in mood and even with the enormous chords in the bass, he still manages to make it sound this way. The ending is beautifully controlled and drifts away magically into the ether. The tenth F minor study is another Presto with some incredibly difficult figurations for both hands. However, as I’ve said before, this pianist seems to have no bother with any of this, no matter how difficult it is. Much has been written about the differences between this and the final version so just pin back your ears and listen out for the unexpected changes – especially at about 1’50’’ where Liszt goes off at a tangent in comparison to the later version. There are numerous accidentals included in this phenomenally difficult piece which here is played absolutely perfectly; nothing is overplayed or overemphasised it is presented as it should be, as given in the score. For the penultimate of these works, we are once again in a more peaceful environment – this piece eventually became ‘Harmonies du Soir’ and the overall atmosphere here is very similar to the later version, albeit with added notes and changes of register. The main difference in this version is the middle section in E major where the bass is given a sort of grumbling accompaniment rather than chords. It almost sounds like a conversation here as one hand answers the other. This is perfectly judged and none of the details are omitted. I like the way he pulls it back very slightly before the big tune arrives again at 5’15’’ and when this happens, it is perfect. The Allegro vivace with tons of octaves and bass chords is very loud and very powerful indeed before speeding up even more to the Grandioso tune in D flat. All of this is rendered so clearly and well that you forget how many notes there are on the page. He also winds down most effectively towards the conclusion of the piece which occurs only about a page and a half from the end but really works very well. The twelfth and final etude begins with a passage not found in the final version – a craggy version of the main theme but in the bass and in octaves. Having played the final version of this piece numerous times, and looking at the score for this version it is abundantly clear how many alterations were made to get to ‘Chasse neige’ – here there are added thirds, leaps and additional superhuman demands placed on the pianist. One really miniscule criticism - I’m not 100% sure but I think I hear one wrong note – in my edition corresponding to the point on the track at 2’41’’ there is a C natural, here I believe he accidentally plays a C flat (B natural) and it does sound wrong however, I am not going to quibble over one wrong note out of thousands, especially in a performance as good as this one! The central section of the piece sees a return of the craggy passage I mentioned earlier before the difficulties are ramped up even more to a jaw dropping level of virtuosity, all of which is coped with admirably. The ending surprisingly, is quiet and wistful and here, with Mr. Jin’s very gentle and delicate way of playing, works perfectly and is extremely well judged. Overall, this is a magnificent recording of a formidable set of works. The cover notes are a little sparse but provide sufficient interesting data about the development of these amazing pieces. There are so many good things to listen out for here is would be hard not to run out of things to say so I shall say simply this – in my opinion this is the best of the currently available recordings of these works. There appears to be nothing that Mr. Jin is not capable of playing and his virtuosity, technique and musicianship is phenomenal. I should also say that I am really impressed that Naxos continues to find superhuman pianists who are willing and able to record so well the more virtuosic piano music of Liszt from the 1830’s, before he refined his style to something less difficult (although still very taxing). As an aside, I’d really like to hear him play some Alkan!